Here I will look back on some of my posts from this year, the embarrassing and disgraceful behavior of the “HBD community”, and the falsehoods and misrepresentations of the “scientific community”. Around the beginning of the year I started doing some admixture analyses of W. W. Howells’ craniometric data. In the K = 4 analysis the ancient Peruvian skulls in Howells’ dataset showed a large amount of non-Mongoloid admixture. I inferred that this admixture was Caucasoid, and cited as evidence the work of Thor Heyerdahl, the obviously Caucasoid features of the Paracas mummies, and the discovery of I2a1a-M26 in Amerindians. The “scientists” who announced the discovery of I-M26 in Amerindians claimed that it was from post-Columbian Basques, and gave as their only evidence an association with supposedly Basque surnames. In my next post I showed that none of these surnames were distinctively Basque. In the following post I presented a great deal of historical and archaeological evidence that Caucasoids were present in the Americas before the Vikings. This post includes numerous photographs of indisputably Caucasoid remains from ancient Peru and ancient Chile. My next craniometric admixture analysis showed that not only was my inference about ancient Peruvian skulls correct, but that in fact ancient Peruvian skulls were on average more Caucasoid than the skulls of any other population in Howells’ dataset. I soon realized that Caucasoid admixture was pervasive throughout all Amerindians, and that genetic evidence of this had been in plain sight for years. To confirm that evidence, I generated a chromosome painting for a Karitiana genotype, which showed that Karitiana chromosomes are a mosaic of Mongoloid and Caucasoid DNA. I also introduced the technique of analyzing populations in terms of other populations, which allowed me to calculate that the Karitiana are 73% Mongoloid and 27% Caucasoid. At the same time, I realized that a major claim made by David Reich was utterly false. That claim is expressed by the figure below, which appeared in a paper written last year by Reich and his subordinates at Harvard. The figure shows Mediterraneans and Amerindians as being unmixed, and Nordics as being hybrids formed from the unmixed ancestors of Mediterraneans and Amerindians. The paper refers repeatedly to Nordics as having “Northeast Asian-related admixture”. The inhabitants of Northeast Asia have been proto-Mongoloid or Mongoloid for tens of thousands of years. Amerindians are (predominantly) Mongoloid, so if Nordics had admixture from the supposedly unmixed ancestors of supposedly unmixed Amerindians, then they would have to have DNA in common with Mongoloids. I produced a chromosome painting and calculator results for a French genotype that showed no Mongoloid DNA whatsoever. I also showed that the Z-score of the f3 statistic for the French as a mixture of Sardinians and Russians is larger than the Z-score of the f3 statistic for the French as a mixture of Sardinians and Karitiana. I then set about identifying exactly what kind of Caucasoid admixture was present in Amerindians, using my new technique. I showed that the admixture was far more Nordic than it was Mediterranean. Later in April I carried out a high K admixture analysis of Amerindians, which gave a detailed characterization of their Caucasoid admixture. In May I used F4 ratio estimation as an independent means of calculating the amount of Nordic admixture in Amerindians. In my next post I excoriated the “HBD community” for believing David Reich’s preposterous claims, pointing out that they flew in the face of the most basic anthropological observations. I mentioned the complete absence of the Mongoloid EDAR mutation in most European populations, which proved beyond any doubt that they could not possibly have any significant Mongoloid admixture. In the comments of this post I for the first time identified two components from an admixture analysis by Vadim Verenich as being associated with Y hg I Cro-Magnon Nordics and Y hg R1 Aryan Nordics. I then put up a post pointing out the presence of the blue eyes allele of the SNP rs12913832 in Karitiana and Surui, which proved beyond any doubt that Amerindians have Nordic admixture. 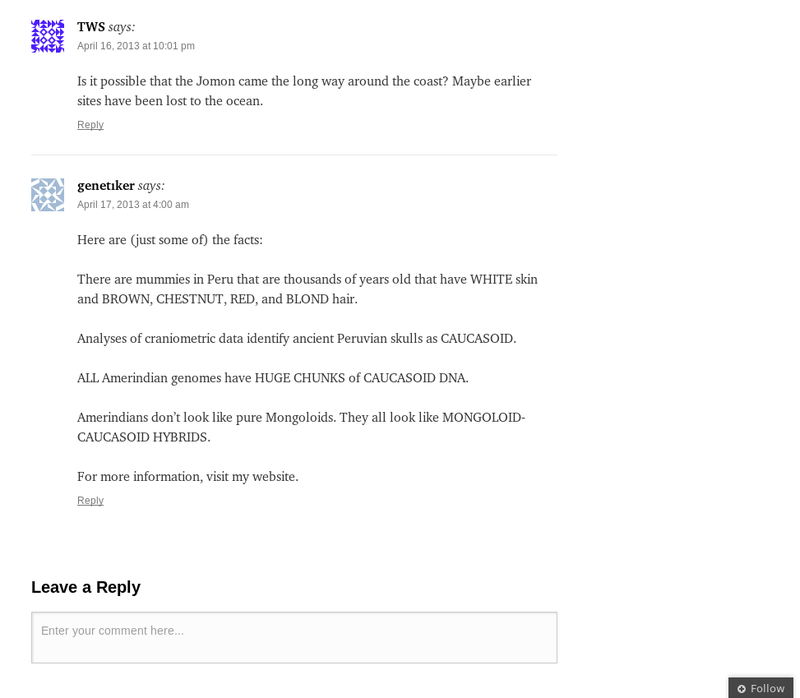 It was a few days after this post that Dienekes made a complete fool out of himself by attacking the F4 ratio estimation phylogeny that I had used for calculating the amount of Nordic admixture in Amerindians. I suspected that Dienekes had been following my blog, because I started out as a commenter on his. I really thought after seeing all the evidence I had presented that Dienekes would have grasped that Amerindians are part Nordic, and not the other way around, as Reich had claimed. But it seems that by this point Reich’s claim had come to be something like a religious belief for Dienekes, and no amount of evidence could convince him that it was wrong. Dienekes’ faith had blinded him to the essential truth of my F4 ratio estimation phylogeny. His criticism of it was that it didn’t yield correct expected values of f3 statistics. But of course that wasn’t what it was designed to do. Its design was dictated by the F4 ratio estimation program. In my response to Dienekes’ attack on my work, I presented a phylogeny designed with f3 statistics in mind, and I showed that one could use it to calculate expected values that are close to empirical f3 statistics. Dienekes responded with a post which he claimed to be “friendly”, but whose animosity was apparent from its condescending remarks. He speaks of my “confusion” and his contribution to my “continuing education”, when of course it was Dienekes who was confused and in need of education. Throughout this post Dienekes puts the Nordic race in quotation marks. Presumably it’s a social construct. Dienekes had demonstrated an inability to count when he denied that there were 16 path combinations for the f3 statistic for my phylogeny, so I helped him out by drawing pictures of all 16. These visual aids must have been effective, because Dienekes never made any further challenge to my phylogeny. In October I posted a high K admixture analysis of Amerindians and Mestizos. This analysis also included ancient DNA samples, and it showed that the Negroid admixture which had been showing up in previous analyses of these samples was actually archaic. The analysis also showed that Maya and Peruvians have a pattern of Caucasoid admixture which is distinct from both the pattern found in pure Amerindians and the pattern found in Mestizos, and which cannot possibly be from the post-Columbian Spanish. Also in this post I deduced that the Nordic admixture in Amerindians is Aryan and not Cro-Magnon, and that it was contributed by Y hg Q proto-Aryan males. In November Eske Willerslev and his associates published a paper in which they pretended to have “revealed” that Amerindians are Mongoloid-Caucasoid hybrids, a fact for which there was genetic evidence years ago, and which my work over the preceding 8 months had made abundantly clear. When asked to comment on this paper, David Reich stated that “Mal’ta might be a missing link, a representative of the Asian population that admixed both into Europeans and Native Americans”. He seems to have forgotten here all about his preposterous claim from just a year ago that Amerindians are unmixed and that the unmixed ancestors of unmixed Amerindians themselves contributed to the ancestry of Nordics. He went on to extol “the value of ancient DNA in peeling back history and resolving mysteries that are difficult to solve using only present day samples”. It may have been “difficult” for Reich to solve “mysteries” like the general descent of Nordics and Amerindians “using only present day samples”, but it wasn’t for me. In December David Reich and his associates published a paper in which they pretended to have discovered that Europeans are descended from Mediterraneans, Cro-Magnon Nordics, and Aryan Nordics, a fact which was understood a hundred years ago, and the genetic correlates of which I had identified 7 months earlier. Just as everyone is now expected to use the cumbersome and idiotic geographical phrases “Western Eurasians”, “East Asians”, “Sub-Saharan Africans”, and “Ancestral South Indians” for the biological Caucasoid, Mongoloid, Negroid, and Veddoid races, this paper introduces the obfuscatory phrases “Early European Farmers”, “West European Hunter-Gatherers”, and “Ancient North Eurasians” for Mediterraneans, Cro-Magnons, and proto-Aryans. The paper idiotically models Europeans as being directly descended from an R* proto-Aryan from Siberia, when of course they’re actually descended from fully-evolved R1 Aryans from Europe.